It’s difficult to remember the dry spring we had - what with the RAIN we’ve had over the last two months! Lawns, gardens, farms and trees are all enjoying the moisture. Unfortunately, the wind has taken down a few trees and branches. One old maple came down right in the Village, in front of Fred and Aleta’s place. 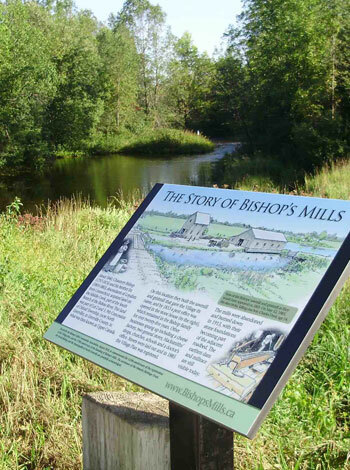 A crowd of enthusiastic visitors dropped by the Village Saturday, May 18 to check out the garage sales, United Church lunch counter and the famous Women’s Institute Made in Bishop’s Mills Bake Table. Pat Moore Headlines Music Night! Saturday, March 23, 2013 - Sold out event! Ottawa signer-songwriter Pat Moore put on a great performance in front of a sold-out crowd at the community hall. Opening for Pat were Bishop’s Mills residents Lisa Poushinsky and Jeanne Lambert, and their group Bella Borealis. 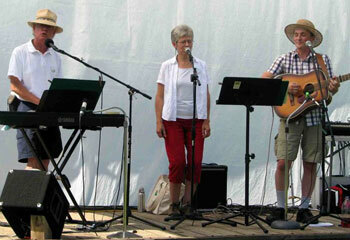 Also performing were Tom Graham & Jeanne Lambert along with Doug Hendry. The evening delivered a friendly mix of folk, blues, jazz and country music to satisfy everyone’s tastes! A delicious array of exquisite ‘Made in Bishop’s Mills’ refreshments was included in the evening’s fare. 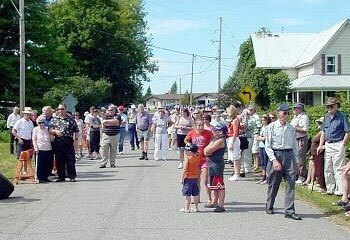 The BMCA hosted the event, with proceeds going towards the Community Hall. Photos on our ‘Photos’ page. Bishop’s Millions came out to celebrate winter with their neighbours on Sunday, Feb. 10, 2013. They enjoyed public skating, broom ball and other ice/snow games at the park in the afternoon, including a tug-o-war that turned out to be a lot of fun. Afterward, all gathered at the Community Hall for a heart-warming pot luck-supper. Community Hall Fundraiser a Success! Saturday, March 31, 2012 - Culture alive and well in the Village! Led by Bishop’s Mills residents Lisa Poushinsky and Jeanne Lambert, the female vocal group known as Bella Borealis entertained a sold-out crowd at the Hall Saturday evening. This year's musical line up included talented local musicians Frank Western & Birdie Whyte as “The Frank and Birdie Show”, Lisa Poushinsky plus the indefatigable Doug Hendry and the Maplewood Ceilidh Band. The evening was MC’d by local musicians Tom Graham & Jeanne Lambert. The Bishop’s Mills Community Association hosted the event, with proceeds going towards the annual upkeep of the Community Hall. Photos on our ‘Photos’ page.